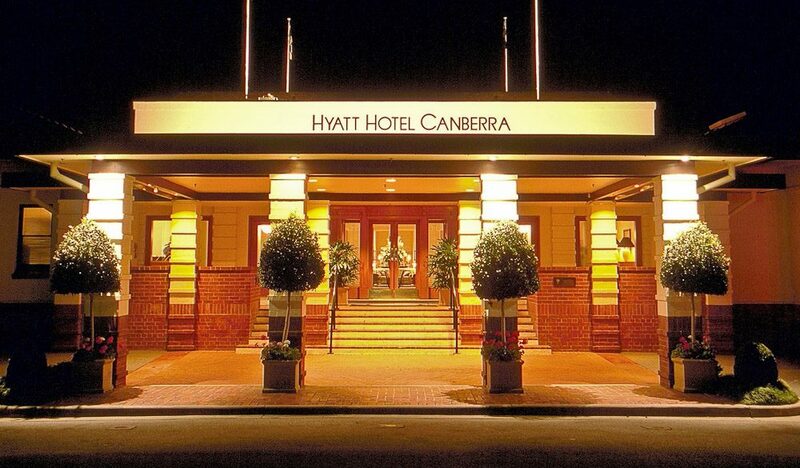 In a town not reputed for classic art deco and not too unjustly referred to as bland, the Hyatt Hotel Canberra is the best place to stay. Although being the only 5 star hotel in the region certainly does help. You’d be hard pressed to find a hotel with more history in Australia. The original structure was designed by the Commonwealth Architect in 1921, who went on to design the Old Parliament House. And when the hotel opened it was actually called a hostel because the sale of alcohol was banned in Canberra. In its early days the building was used for many things other than just housing guests. It served as a holding pen for alleged offenders awaiting transfer out of Canberra; it stored much of the material for the Mount Stromlo Observatory and a few government offices. Prime Minister James Scullin actually lived in the hotel throughout the depression to avoid incurring the costs of living at the Lodge. The hotel fell out of favour and closed its doors in 1974, re-opening in 1988 after careful restoration of the original art deco structure, as well as the addition of a seamless extension continuing on from the superb structure. The rooms themselves are very spacious — the smallest room is a whopping 41m. And like any top quality hotel the bathrooms are indulgent black marble. Almost every visiting dignitary stays in the presidential suite, so be ready to rub shoulders with leading politicians and bureaucrats of the world. Whether that’s a good thing is entirely up to you.